Q: Does the Regiment have a Structure? A: Yes, The regiment has a structure with a hierarchy of officers. Q: Why is your uniform all blue? A: The coat colours of the Regiment are based upon that of Earl Rivers’ Regiment as it appeared at Wallingford Castle in the winter 1642/3. The contractor Thomas Bushell supplied suits to the number of 4,000, enough to clothe all the foote at Oxford and Abingdon at that time. Of these suits, 2,500 were all red and 1,500 all blue. The issue comprised of “cassocks, breeches, stockings and caps”. Q: How do I become an Officer? 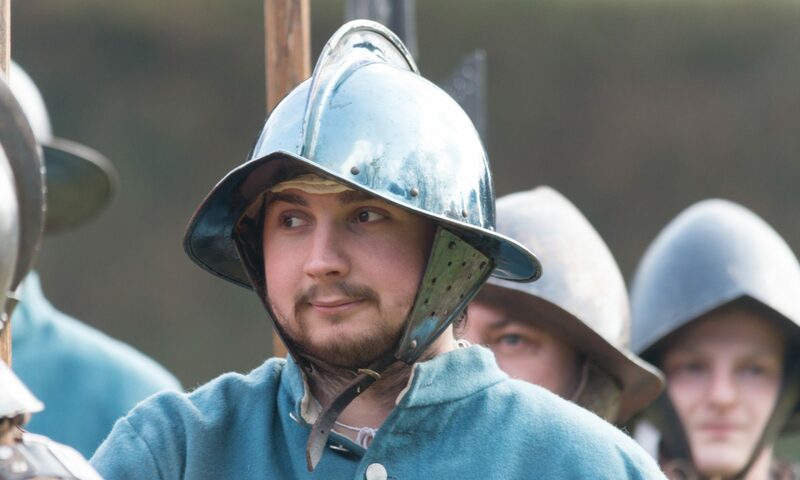 A: It takes time, commitment and aptitude to become an Officer with the Sealed Knot. Every Officer started off as a common solider and through their ability have made their way up the ranks. If you want to become an Officer the only advice there is, is stick with it and see how you go. Q: Do you meet up out of the main season? A: There may not seem as much to do out of the main season but yes there are still one or two musters to attend. Monthly meetings at a choosen Pub in Newbury. And at least one social event. Q: How do I find out if anyone lives near me? A: That’s easy. Just contact the Regiment and we’ll let you know who’s in your area. Also handy if you need a lift to any muster. Most regiments will have one or two spaces left in someone’s car for you and your kit.